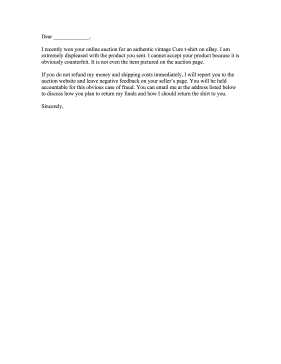 File a complaint with an online auction using this feedback complaint letter. I recently won your online auction for an authentic vintage Cure t-shirt on eBay. I am extremely displeased with the product you sent. I cannot accept your product because it is obviously counterfeit. It is not even the item pictured on the auction page. If you do not refund my money and shipping costs immediately, I will report you to the auction website and leave negative feedback on your seller's page. You will be held accountable for this obvious case of fraud. You can email me at the address listed below to discuss how you plan to return my funds and how I should return the shirt to you.